The STERRAD Velocity™ is a hydrogen peroxide biological indicator system that uses advanced optical measurement technology to confirm sterilization of reprocessed surgical instruments within 30 minutes, rather than 24 hours like other systems. The fast turn-around helps meet operating-room demands, and the embedded technology reduces the risk of prematurely releasing frequently needed surgical instruments. 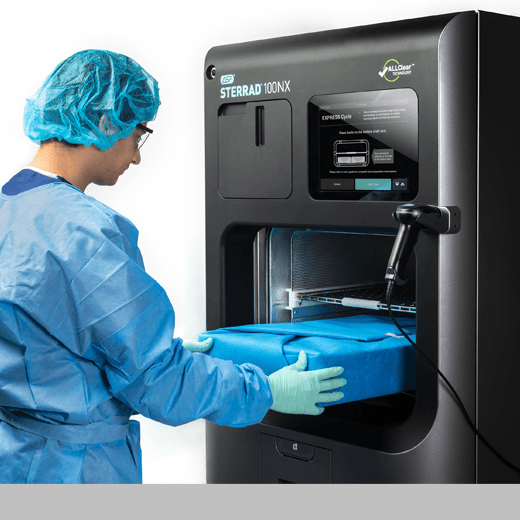 The STERRAD ALLClear® system is the next-generation low-temperature sterilization system that helps central sterile service departments sterilize and reprocess instruments for operating rooms quickly and consistently. The ALLClear® technology uses proprietary algorithms to minimize interruptions and cycle cancellations and to increase efficiency.